Mary Tucker wanted to quit smoking and lose weight for her New Year’s resolution, and she did just that with the help of the Wisconsin Tobacco Quit Line. Mary Tucker started smoking when she was 15, while her young brain was still growing, and kept lighting up for 50 years. But, late in 2018, she quit for good with the help of the Wisconsin Tobacco Quit Line. She made one of the 11,766 total calls people made to the Quit Line for help in 2018. She said the combination of the free medication and coaching from the Quit Line made the difference. She used the patches for a steady dose of nicotine, and the nicotine lozenge when she had urges. It used to be that smokers had to call 800-QUIT-NOW if they wanted to access Quit Line services, or be referred by a healthcare provider via fax. Now, in addition to those options, smokers can be referred via electronic health records or sign up online at www.WiQuitLine.org. 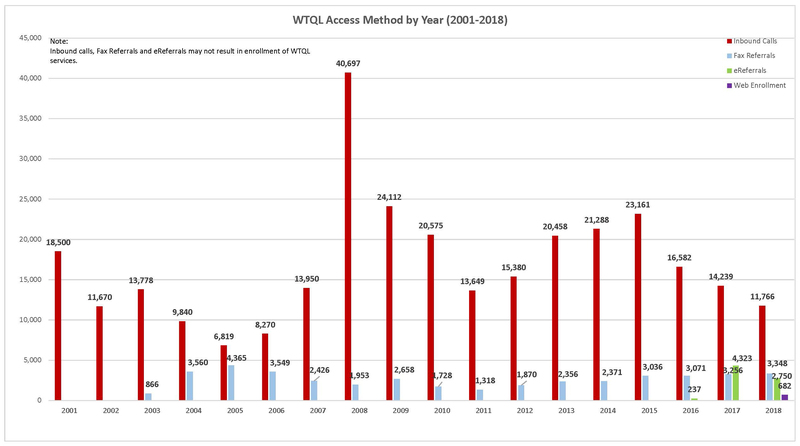 This chart depicts various ways tobacco users accessed the Quit Line by year. Click here or on the chart to see a larger version. 11,766 people called the Quit Line. 3,348 people enrolled in services via Fax to Quit. 2,750 found the Quit Line via eReferral. The past few years, the Quit Line has experienced an increase in the number of calls from people who vape nicotine and want to quit. 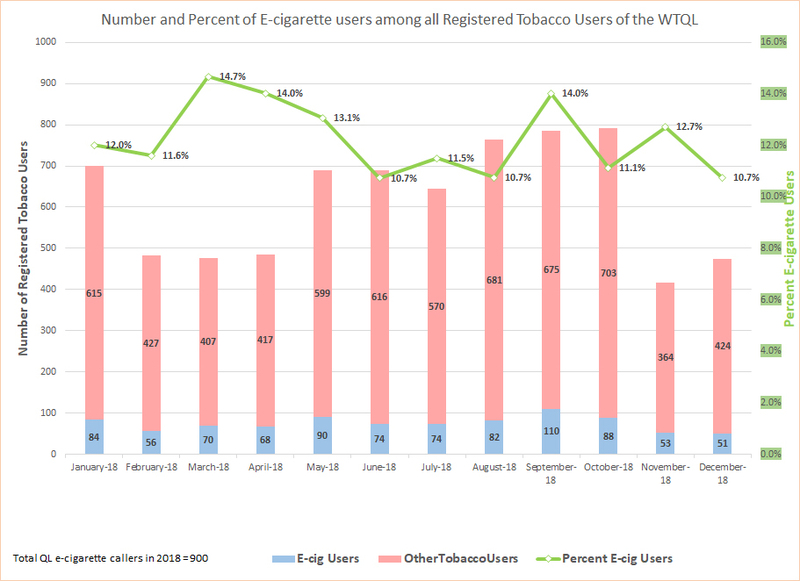 Last year, the Quit Line assisted 900 people who vaped, up from 858 the previous year, representing approximately 14 percent of all tobacco users. Among registered users who said they vaped, the average age was 44. Only 2.4% of them exclusively used e-cigs. The rest were dual users of combustibles (or smokeless tobacco) and vapes. This chart depicts trends regarding people who vape and contact the Quit Line for help. Click here or on the graph for a larger view. With youth vaping up 154 percent among Wisconsin high school students and 272 percent among middle schoolers, it’s possible the Quit Line will see an influx of calls from people wanting to quit vaping in the future. The Quit Line uses similar techniques to help people quit vaping as they would those who want to cease smoking, taking into account the total nicotine in the vape products as best they can. Another trend emerged in the last few years: More callers are suffering from chronic illness like cancer or COPD. In 2006, 40 percent of callers reported having a chronic condition. In 2010, 45 percent had a chronic condition. In 2018, more than 54 percent had one. Not only that, but about half of those who contact the Quit Line are uninsured or underinsured. One caller who quit in late 2018 said she had relapsed, in part because she was chronically ill, struggled to pay bills and felt depressed. Every year since 2001, the Wisconsin Tobacco Quit Line has helped thousands of Wisconsin residents break free from addiction and live longer, healthier lives. 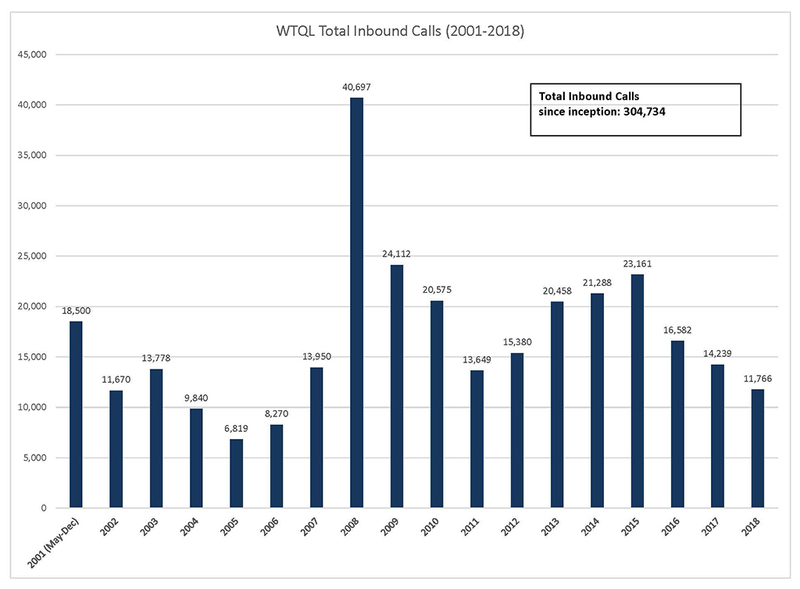 Since inception, the Quit Line has received more than 300,000 calls. Click here or on the chart to see a larger view. The Quit Line has also been integral in UW-CTRI research, such as Dr. Stevens Smith’s R01 grant, the Striving to Quit project that helped Medicaid recipients—including some who were homeless, and the current Improving Quitline Support Study (IQS). Tucker agrees. She would refer a friend to the Quit Line, and would be there to support the friend—just as the Quit Line was there for her when she needed it. Her quit coach helped her break the routine of having a cigarette with her morning coffee. Tucker is elated to have quit.